The ESD container is popular in most industries with it being stackable and reliable. | George Utz Ltd. The RAKO ESD euro container of UTZ is electrically conductive and can be transported manually using two handles. These plastic containers is versatile and can be used in many industries. 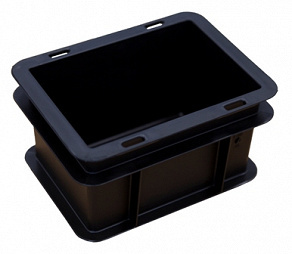 The ESD container with dimensions 200 x 150 x 120 mm has closed side walls and a closed bottom.